You know when you walk into a place and everything just feels right? It’s homey, warm, and inviting. A place that feels like home. That’s what it feels like at Yellow Dog Eats. Yellow Dog Eats is nestled in a neighborhood in Gotha, right outside of Windermere. It’s located in a house that is over 100 years old. Inside, you’ll find wood walls, low lighting, and a cozy atmosphere. Oh, and a killer outdoor backyard setting that I know I would want to duplicate in my own yard. 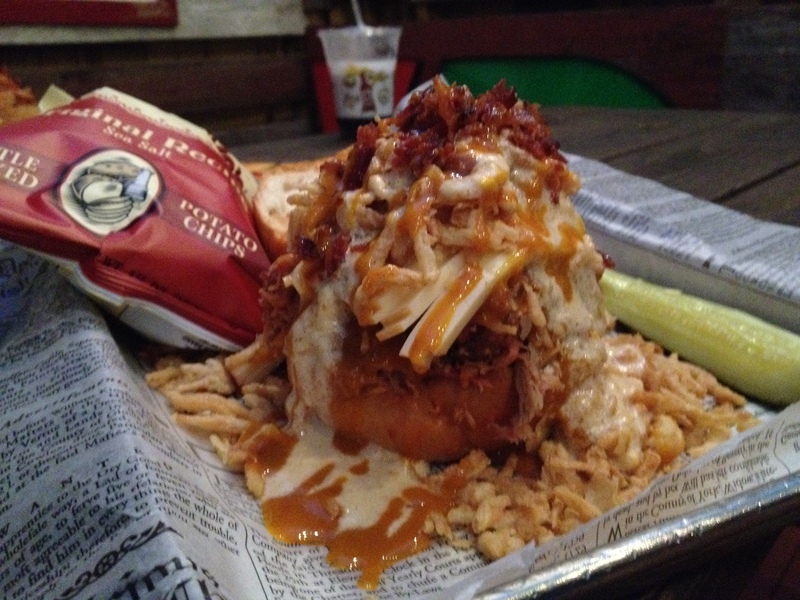 Josh went with the “Drunken Pig:” a pulled pork sandwich topped with pecan-smoked bacon, Gouda cheese, crispy fried onions, Fish’s Gold BBQ sauce, homemade beer cheese soup, and scallions. I chose the “Mr. 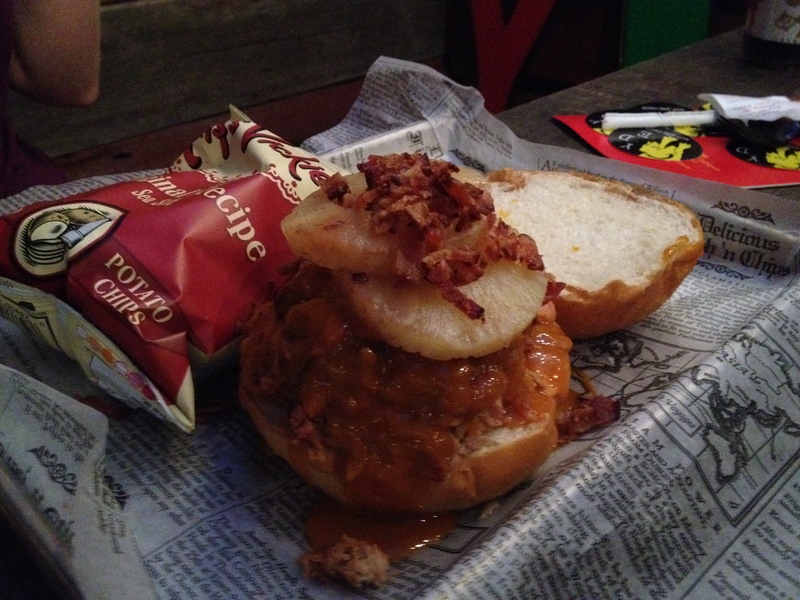 Smokey:” pulled pork sandwich topped with juicy pineapple slices, fried onions, pecan-smoked bacon, and Fish’s Gold BBQ sauce. I asked for no fried onions, though. I’m not an onion lover. 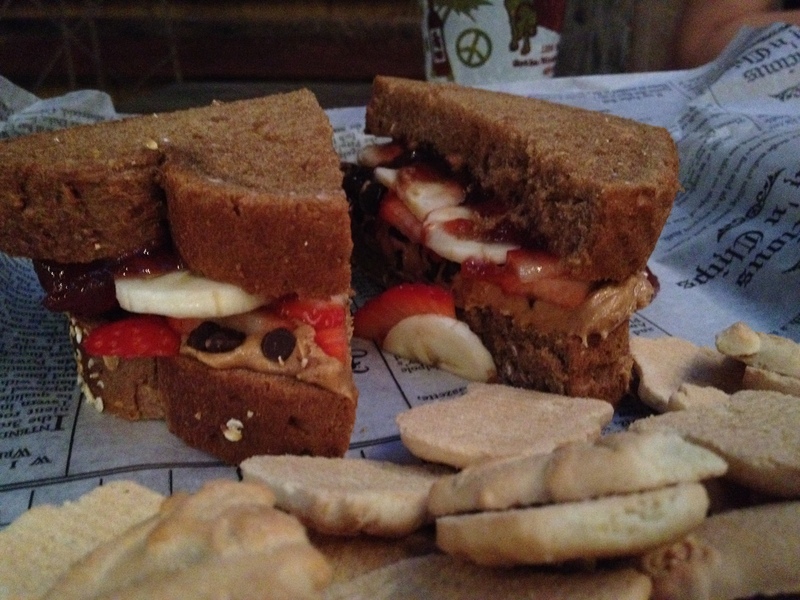 The little man got the “Puppy Love:” peanut butter, strawberry preserves, sliced bananas, fresh cut strawberries, chocolate chips, chopped roasted peanuts (which he nixed), served on multi-grain bread with animal crackers. The pork was juicy, and the BBQ sauce flavorful. You can get that anywhere. It’s the toppings that pull everything together and make the sandwich memorable. And now my Pavlovian response has turned into a rabid and insatiable craving that only a YDE pulled pork sandwich can slake.